The American painter Martin Johnson Heade started out as a portraitist and took up landscape painting late in life. He spent three years travelling around Europe during his formative years. This first Grand Tour marked the start of an itinerant lifestyle which he continued to lead throughout his entire existence. From 1840 to 1859 he lived in Philadelphia, New York, Saint Louis, Chicago, Trenton and Providence. His second trip to Europe at the end of the 1840s brought about a shift in his style towards a more sophisticated type of genre painting. 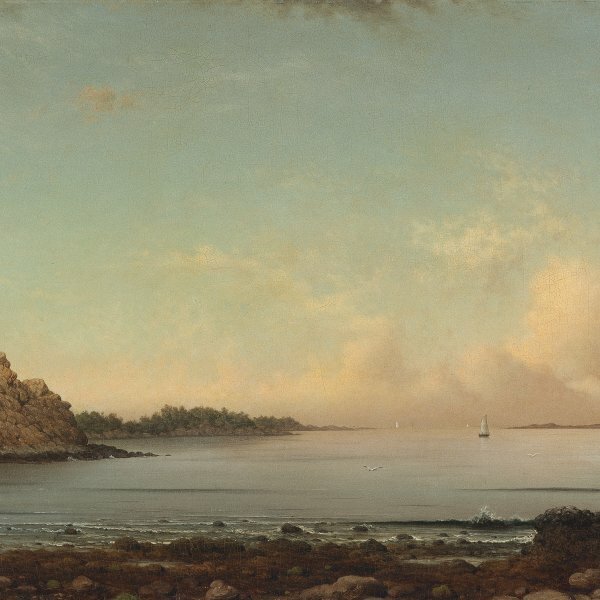 He moved to New York about 1859; there he came into contact with other landscape artists such as his lifelong friend Frederic E. Church and began to paint landscapes. Despite exhibiting his work at the National Academy of Design on several occasions, he never became a member and nor was he particularly involved in the New York art scene. Heade’s mature style, characterised by great precision and luminosity and influenced by the work of Lane, whom he may have known, was later dubbed Luminism. The numerous scenes conveying the calm and splendour of the salt marshes are the compositions that have earned him greater fame. This marshy ground provided Heade with the opportunity to capture changes in the atmosphere and light. Possibly encouraged by his friend Church, Heade travelled to Central and South America (Brazil, Colombia, Panama and Jamaica) three times between 1860 and 1870. During these trips he painted exotic flowers and birds, in addition to scenery. The combination of these motifs resulted in his original still-life paintings of orchids and humming birds in tropical settings, which are acknowledged as the most original part of his oeuvre. In 1883, at the age of sixty-four, Heade married and moved to Saint Augustine, Florida, where he continued to paint the tropical flowers that grew there. He died there years later, completely forgotten by the art world.